Patchwork Shepherds - Patchwork ShepherdsTestimonials Thank you to the many families that provide a wonderful home for our puppies and a special thank you to those who update us with pictures and stories of their dogs. We appriciate those so much. I have over 28 years of GSD experience with my own dogs as well as being involved in rescue as well as training. It's my passion and I was thrilled to meet Kim who shares this same passion for this amazing breed.Choosing a good breeder is a difficult process especially when they are located in another state. Do your due diligence and I'm certain you'll find Kim's breeding program exceeds most others in the US. The quality of her dogs is just amazing. The prices are affordable and there's no limit as to what you'll be able to do with your pup.Not only is Kim available for calls and texts, but she also provides many pictures each week of each pup. This is such an exciting time and you'll be part of the process. You will be able to see your pup grow each week. Details about each pups progress with be provided so that you will be able to select the pup of your dreams. In August of 2017 I got Kodiak (Kody), a Britta/Ryker pup. He was, and still is, such a happy pup. He loves people and because of his experience with Kim's children, he adores kids. He completed Obedience Classes and went on to more specialized training. To date I have yet to find anything that he can't do. He's just so intelligent. When you look at Kody you can see he is a well bred GSD. His structure and gait are perfect and his coat is long and luxurious. His temperament is rock solid and he is trustworthy in any situation. He also enjoys an occasional day at Doggie Daycare where he is good with dogs of all sizes and breeds.Recently it was time to add another pup to my family and I immediately called Kim. Once again it was an amazing experience. I loved the weekly pictures and all the updates. I got Sasha (Lizzie/Cap) last week and I couldn't be happier. She really is the pup of my dreams. She's confident and just a happy go lucky puppy.I'm so thankful I found Kim and Patchwork Shepherds. If you want a more personal recommendation please feel free to contact Kim who can give you my phone number or email address. Rosa MackProud Mom to Eli, Kody and SashaAnd always in my heart, Shiloh & ShoshiEvery dog deserves to have a human that thinks they are the greatest dog that ever lived.﻿I got red collar male from Charlie X Ryker's litter. I messaged Kim over a year before getting a pup with lots of questions and concerns. I was able to get a puppy sooner than expected and got Malachi after contacting tons and tons of breeders. Patchwork stood out to me because they were always extremely responsive, professional, and their goal was just what I was wanting. Upon getting Malachi, we had a few bumps in the road no fault of anyone. Kim was there 100% through the entire process. We had tons and tons (and tons) of questions, and sometimes just needed reassurance and I always got a response. Malachi was the first dog I bought from a reputable breeder officially. I got Malachi for service work. Malachi will be trained as a medical alert and response dog. His temperament is solid. He has to taken to my training methods well. He is super driven and is always ready for the next step. He definitely took after his Czech working lines. He has already started public access training and is doing significantly well. I am putting tons of work into him, and he is absolutely showing the result of that. We dabble in other dog sports, and Malachi is so versatile. He especially succeeds at bitework. He's got an amazing grip for his age, calm, but driven. His structure, movement, color, everything is gorgeous. I deal with shepherds daily and you can see a well bred shepherd shine through. We get stopped all the time. Malachi has made us shake our heads, laugh, cry, but most of all has brought a tremendous peace to us In a very difficult time. He is so playful with our other dogs, and is ready to make friends with everyone. He is the ultimate class clown, with a French accent (lol, he's trained in French so we just assume he's French). He does things that make everyone laugh in the room (like hike his leg at 10 weeks hehe), but he comes up to you when you need him, he's got such an amazing bond with me. His focus is incredible for his age. Malachi came at just the right time in my life. He's definitely a special little guy. I want to especially thank Kim for helping us. It's so hard to find a reputable breeder who genuinely cares about their puppies and clients. Someone who puts the work into health testing, producing stable temperaments, solid nerves, and creating the ultimate German Shepherd, what they should be. The dog world is so opinionated, but I can say you won't go wrong with a patchwork pup! ﻿Hi Kimberly, I wanted to let you know how happy and complete our family is now with the addition of Max. He is a big strong dog, yet so gentle with our girls! He is so lovable, loyal, and friendly. We couldn't be happier. Thank again! !Orange Collar Charlie x Ryker Male Patchwork Shepherds has been a grand slam of awesomeness! Very helpful, accommodating and aiding us to find the right fit and parents to get a puppy from. They have the best K9’s in the treasure valley, a great selection of parents, and I searched for 6 months researching all over Idaho, Washington and Oregon. Their K9 selection is better than anything I could find for sure!! Patchwork is clearly a breeder who know their stuff and cares about their dogs! Their dogs are all astounding and I highly recommend them! Whether you want a service dog or a family pet! We eventually ended up adopted a 1.5 year old female named Ivy and she has been EVERYTHING they said she is!! So happy! Thanks again Patchwork Shepherds! I will get another dog from them in the future. 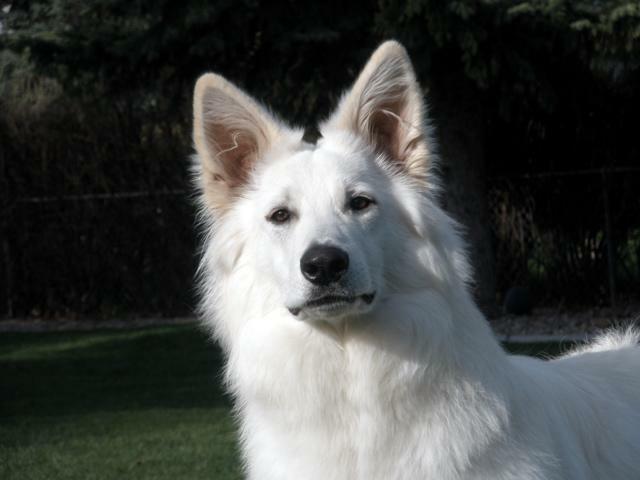 ﻿ Hi Kim just wanted to update you on my beautiful Odysseus ( charlie/ryker) every time I think you can't top yourself in your breeding program you prove me wrong .. Odysseus is my third patchwork shepherd and omg what a dog.. gorgeous intelligent and the sweetest boy ever .. I can't say it enough Thank you.. you stood by me helping my dream come true .. ﻿ Hi Kimberly, I wanted to send you a few pics of Indi. We are so happy to have her. She is very smart, loves to take car rides and go on family activities. She is already over 40 pounds! Take care, Mike﻿Myah/Cap Female Hi, Kimberly It’s been awesome staying in contact since we brought Sloane (Ryker xTasha) home in March. She has been so much fun and what a wonderful addition to our family here in Montana! She is gorgeous, smart and as sweet as can be. You have been so helpful, thank you for sharing your knowledge of this beautiful breed! Patchwork is the best! We can’t wait to add one more girl to our family this year, her name will be Gia (Lizzie x Cap) 💖It’s been an absolute pleasure, we look forward to a long doggie relationship.Kim, Cole and ShainaRonan, Mt﻿ Hi Kim,The portrait was taken professionally at our clubs recent training seminar held in Missoula Mt. 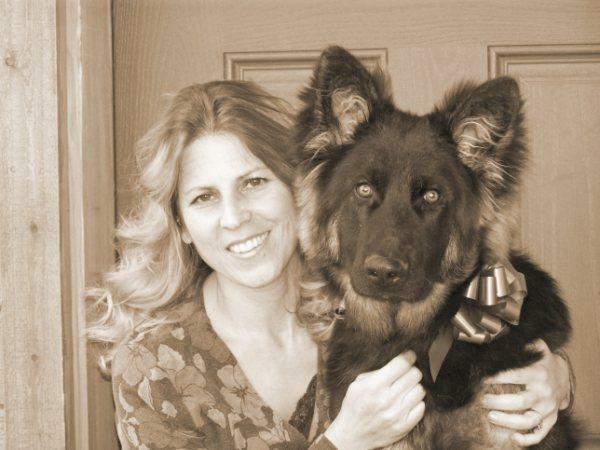 Mary Jane Shervais is a trainer and long time dog show judge out of I believe Spokane. She came to teach on obedience, rally and agility techniques and the changes to AKC Rules and Requirements for Titles starting in May. Wyatt was so good at his very first event. Everything was new to him, but he watched and took it all in and was so well behaved for a baby. He was the youngest dog by far. Mary Jane said he showed great promise and she was sure he would do well.Wyatt enjoys romps with our Sheltie, Annie Oakley, and loves to learn new things. He is a real problem solver and thinker too. We love his playfulness and he has such a soft mouth so playing with him is easy. Perhaps one of Wyatt’s most endearing traits is that he takes everything in stride. He is not bothered by new sounds, sights or animals or people. This pup just takes it all in and carries on. He is focused and so intelligent. I love the way he seeks my company and chooses to lay at my feet any chance he gets. Wyatt is a cuddler who also loves car trips and I take him everywhere I can. I look forward to adding a female from Patchwork Shepherds to train and show both alone and as a Brace with Wyatt. Kimberly and Patchwork Shepherds, thank you so much for your dedication to the GSD. Wyatt really catches attention wherever he goes and he always seems to be smiling and happy. He is amazing. We love him. Elaine Hi Kim .. Just figured it was time for a new testimonial since I've added Nakita and soon Odysseus.. Along with my beloved Achilles .. I found your kennel 3 yrs ago . And what a true blessing it was .. Your not only a caring loving breeder your an amazing person . It shows in the quality of your dogs and pups.. I will soon have 3 patchwork pups .. Achilles ( tali and tatsu) now 2 yrs old... nakita ( lizzie and cap) now 1 year... And my newest addition Odysseus. ( Charlie and ryker) .. 7 weeks ... These babies are my world and have changed my life forever .. I couldn't ask for better furkids not only extremely smart and great disposition they are drop dead gorgeous ... Thank you so much for giving me so much joy from these beauties... 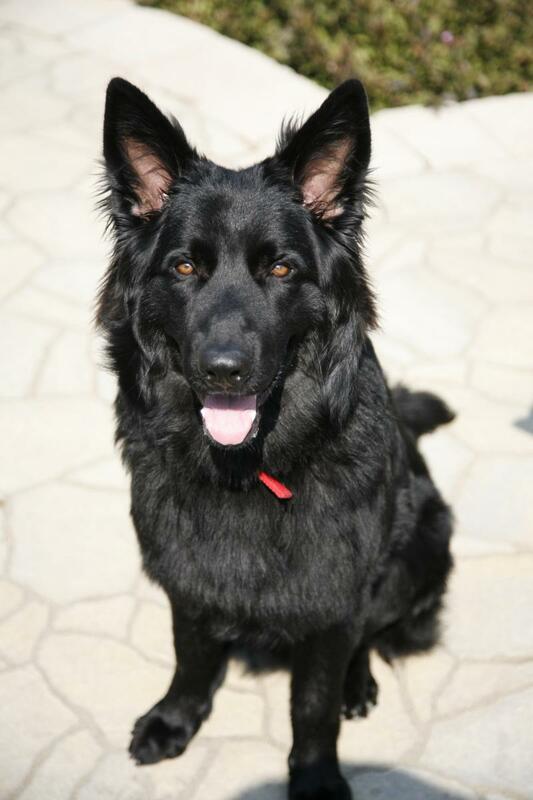 Sincerely Carolyn Achilles Nakita and of course Odysseus﻿ ﻿﻿In the Spring of 2017, after losing several of my beloved dogs, I started searching for a German Shepherd breeder to adopt a new family member. I knew exactly what I wanted so I had to go through a lot of breeders all over the country before I found Kim at Patchwork Shepherds. Her personality, her knowledge, her dogs, and her priorities in her breeding program checked all my boxes and I knew we were a good fit right away.After agreeing on which litter and which puppy (Maya/Cap female born 7/22/2017), she kept me well informed with the progress of the pups and sent weekly photo albums. Not just a picture, but a bunch of pictures, which I just loved and waited anxiously for them each week. She was always available to answer questions and share her extensive knowledge with me, which was very impressive. When it was time to ship my pup to me, I live in Pennsylvania so the pup had to go to Newark, NJ airport, she worked really hard on getting the best flight for my baby girl. When it got cancelled because it was too hot on one end, she worked really hard again to get the next best flight without making me wait much longer because she knew how disappointed I was. When the pup was on her way here she was on the phone very early in the morning on her end to check and make sure all went well.When I received my new baby I was please to see after quite a long day of being in the crate and all the scary new stuff she had just experienced she came out of the crate ready to play. She seemed no worse for the wear. The vet check went perfectly, my vet was very impressed with the health, temperament and, of course, the beauty of my new family member.I couldn't have asked for a better experience and a more perfect puppy, in fact, I am getting another pup from her right now. I have between 7 and 8 weeks to wait.......not sure I'll make it, lol!! Can't wait to get my next baby from Kim at Patchwork Shepherds.Thank you and keep up the good work Kim!Carol and Secret from the Poconos, PA﻿ Just wanted to let you know how Brody is doing. Best dog I have ever had. So smart and his temperament is just awesome! Thank you again. Billings FamilyMyah x Tatsu Puppy﻿ Merry Christmas Kim and Family! I wanted to follow up with you and let you know how Ceraak was doing. He’s 1 1/2 years old now and I have to say the most amazingly wonderful companion anyone could ask for. He graduated from 3 different levels of training with complete success. He’s playful, super smart, loving, gentle, and funny! He is constantly talking to us when he needs or wants something. He is always trying to take care of us, never leaves my side and always “hearding” his family safetly. He’s transformed our lives in a way I never thought possible. I’ve owned big dogs my whole life and he stands out amongst them all. He’s such a wonderful addition to our family. We couldn’t love him more. I wanted to personally tell you how thankful I am for Patchwork Shepherds. You breed gentle, smart & sweet shepherds. Sending you blessings this holiday season. May you be blessed as much as you have blessed us. 🤗💙 Merry Christmas! Mathew & Autumn Otis Orchards, WAKora x Tatsu pup ﻿ Hi Kim, Hope you had a happy Thanksgiving. I thought I’d just update you on Reba (Britta/Ryker purple girl) and tell you what a fantastic pup she is. As you know, I’ve had more than 15 GSDs over the last 30+ years and she is one of the absolute best dogs I’ve ever had. Her temperament is outstanding. You have a winning combo with Britta and Ryker. We have been asked several times in our puppy play groups and classes to help socialize a shy and/or aggressive puppy because Reba is so neutral and “reads” other dogs very well. We stay after class is over and have a one-on-one with the “problem” puppy with great success. Today we took her to a winter carnival with all sorts of children, zoo animals, circus rides, etc. and she was amazing. Loved it all. We couldn’t walk 10 feet without people stopping and admiring her demeanor and beauty. At 5 months she is already heeling off lead. Still have a little trouble with “stay” cause she wants to be at my side constantly! We start our CGC class in 2 weeks and puppy agility in Jan. If all of her health tests this next year come out ok, I will definitely like to breed her. I’ll keep you posted on our progress. Have a wonderful holiday season and best wishes always, Carolyn McKee﻿ Hi Kim, We got the green collar male from Tatsu and Myah’s litter in December of 2014. I can’t believe it’s almost been 3 years! I came across his contract the other day and thought I’d send you an update! Oakley is the BEST pup!!! He has such a sweet and fun personality. He is the best family dog and we couldn’t be happier! He loves to ride in the car, swim, hike, play with other pups, play Frisbee, cuddle on the couch (he thinks he is a lap dog…and we let him be), and his pup cups from Freddy’s! J All of our family and friends love him so much that we have actually had 2 friends, 1 co-worker, and 1 neighbor get puppies from you in other litters! We get stopped all the time and asked where he is from. He really is such a handsome and loving boy. Thank you so much for Oakley!!! He is more than we ever hoped for! I’ve attached a few photos for fun. I hope you have a wonderful holiday season! Thanks, Nikki & Ryan Loki is the sweetest most caring puppy I have ever had, he is always finding new ways to brighten up my life. He is so incredibly smart and aware of how I am feeling, whenever I am upset or anxious he will not let me be until he sees me smile, he will sit there and act like a total dork, rolling around and kissing me to be sure I am okay. I could not see my life without this special boy, he loves water and playing with children in the water throwing his front paws up to splash them. Even though he is such a big puppy he is so gentle around people and animals that are smaller than him. Everyone I've ever met just adores Loki and his bubbly and dorky personality.Loki isn't just a dog, he is my son. My sweet loving, smart, incredible son. He love's his mom so much he follows me everywhere I go with his big dorky smile on his face. Whenever he's not around I feel lost, he is like my emotional support dog, I need him in my life as much as he needs me. I am so grateful to have such a wonder beautiful dog in my life and I'm so thankful to patchwork shepherds for doing all that they do and bringing this wonderful gift into my life.﻿ Kim, Hope your holidays and 2016 went well! Thought we would share some pics and update with you from Colorado on Lilo who just turned 1 a couple weeks ago. We get so many compliments on her looks, she really is a beautiful girl. I chuckle at the people who have to ask what breed she is, those who are passionate about the shepherd breed know without a doubt that she is a shepherd and love her look. She is amazing to watch, her gait is like a prancing pony the way she throws out her paws gaining the attention of those in her presence. She loves to jump hurdles, fetch, get affection from us and play soccer with my daughter. She is very smart (too smart at times! ), loves to ride in the van and does not hesitate in trying to claim our bed as her own at night, but then happily settles for her own bed a few feet away shortly after. She was easy to housebreak, picked up on ringing the bell to go out in less than 2 days and was fully house broke within a few weeks of getting her home. She is even very good about not going in anyone's yard or at the park, has never had an accident in the van when we take her for walks or social time and will gladly wait until she gets home to do her business. She loves to play and herd around with our other dog but given his age and size to her we are seriously considering getting another shepherd this year so she can have a young playmate to keep up with her. It was well worth the drive from Colorado to get her from you and if we do decide to get another shepherd you can be assured you will be our first choice again. ﻿ Our pup, Kaytu (Kora x Tatsu), named after the second tallest mountain in the world, K2, one of the most adventurous and dangerous mountain to climb, lives up to her name as she is always ready to face whatever challenge is before her whether it be chasing a frisbee through the trees, swimming across an icy mountain river, riding a boat, or pulling a bike as fast as her little paws can carry her. We are so thankful we found Patchwork Shepherds. Having never met a dog or human she doesn’t like, Kaytu always wants to be in the middle of the action whatever that may be. She completed her first two camping trips this year as well as road tripping internationally to Canada. Her absolute favorite thing to do, however, is frisbee golf. As soon as the frisbee leaves your hand you’ll hear her yipping happily the whole way after it. When you finally catch up with her, she will be standing proudly over her prize and waiting patiently for you to throw it again. Thank you Kim for our wonderful pup! She’s everything we hoped she’d be and more. Keep up the good work! Hi Kim, was so happy to find you and your beautiful shepards ...I was so impressed with your breeding program and the exceptional care you take of your shepards ...My Achilles that I bought from you (tali, tatsu)...is truly a remarkable pup ..bone structure, head , temperment, and amazingly smart..not to mention drop dead gorgeous. ....this pup trains so easily it's not even work...Also so excited for your new blood line and my new pup to come..To find a breeder that you truly trust and confident that you are getting the best pup out there is huge. I will always recommend you and your shepards to anyone looking for the highest quality I've seen in quite awhile..so happy to do business with you now and in the future...sicerely. 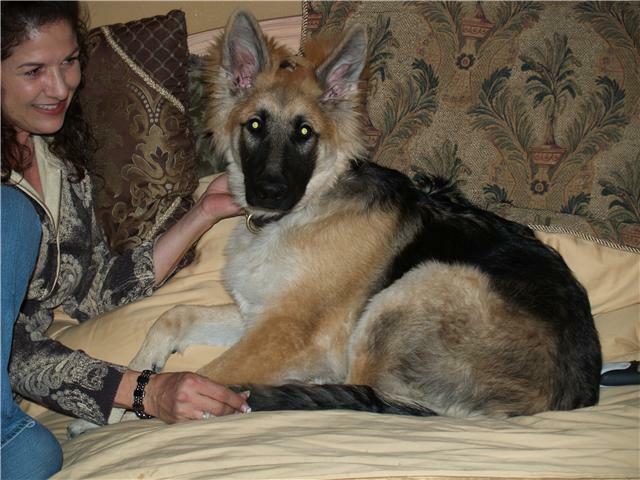 Carolyn and Achilles ﻿Hello Kim;Here is my Echo at 6 Months...I just wanted to thank you for such an amazing pup! His first week home with my family he was happy as can be! He always looks happy and has a smile...even my 17 year old son says he's never seen a happier pup/dog. No potty accidents ever even as a little guy, he runs to the door and let's us know it's time...He was play pen, crate, and bed time trained...He is so smart and willing to do whatever I show him...he even knows to go drink when I say water...I hope you will continue to provide such quality shepherds and wonderful additions to family's for years to come! I will be a repeat home for your pups...believe me! I really could go on but I'll just say...by his 1st month Echo would sit, stay, come, get in the house, knew cookies where treats, lay down and wait for his meal...the 1st time I told the dogs (his sister Reese a 2 year old Great Dane and his brother Titan a 5 year old boxer) to go lay down and Echo at 10 weeks beat them both to their spot laying down... he got some huge praise and cookies 1st, the others of course got theirs just after Echo LOL!I know he is dedicated to me and the most loyal companion! When I think of bringing Echo home...I am so very great full and know he is that dog that will be remembered for the years to come even after I have to eventually say goodbye...I have had dogs since I was 18 years old and I've had 3 dogs in my life that there has been such a bond between them and I and Echo is the 3rd and I'm now very close to 55...I've loved the other dogs I've had through the years of course but dog people know what I mean about that special dog that even years after they've left this earth the love and memories are still so very strong in our heart and mind...so I just wanted to Thank you for my boy!!!! Have I mentioned not only is he amazing...he's gorgeous! Thank you, thank you!!!! Dear Kim, We wanted to express our gratitude for making the puppy buying experience pleasurable. The attention to detail, up to date emails and the timely replies are a true testimate of your character. Despite the 2700 mile distance, we never felt uninvolved. Being compassionate and tolerant during our decision stage, only strengthens our confidence in Patchwork. Thanks for understanding of our family dynamics, it has given us assurance; we found the right breeder and perfect quality puppy. On a side note, We are apologetic for any inconvenience or interruptions we may have caused you and your family. Please extend our gratitude and acknowledgment to your family. With sincere Thanks from a family filled with excitement, THANK YOU! The Hansen Family,St. Petersburg Florida. Looking forward to providing the Best Family Life for “Yellow”. ﻿Thanks again for our wonderful girl Arya. She has great conformation, exceptional movement and is the happiest dog I have ever owned. Her job as a therapy dog for an 83 yr old woman that had is stroke is one she takes very seriously. She also is our guard dog and patrols the 20 acres we live on. We continually have Home Health therapists in daily and she greets each of them then quietly goes to her spot to watch everything that goes on. She accompanies me into the chicken coop and is great with the chickens as well as with her cat ( yes her cat that she found in a ditch). She passed her Herding Instinct testing at 5 months of age and now working on her Canine Good Citizen certification. I have owned and worked with many breeds of dogs and Arya is by far one of the most intelligent, willing and trainable. 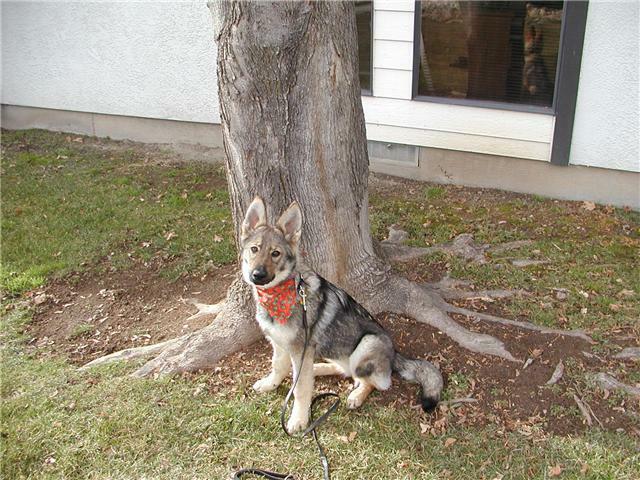 She came to us very well socialized and is truly a pleasure to own. I would totally recommend PATCHWORK SHEPHERDS and have friends now that have bought puppies from here as well and all of them are as wonderful as Arya. Thanks again for the diligent work you do to produce such great dogs. I cant wait to get my next dog from you. DANELLE BOON﻿ Isolde is a WONDERFUL dog. But we knew that from the moment Rob picked her up. He said, "she is really a love," and described her gentleness and cuddling even from the get-go. And she IS a love. She is very playful with her 'brothers' (two older choc labs), but is extremely responsive to me and is my 'watcher.' No matter where I am, she is watching over me. When I go to another room to do laundry, she quietly follows and lays down to watch. I move back to the kitchen, and she is there again with her watchful eye. When we settle in the evening to watch a movie, she will quietly peruse the house, coming back to my side after she has checked everything out. Does she know how big she is? No, I don't think so! If she could, she would hop up on my lap and sit there, just as she did when she was a fuzz-ball pup! She just loves to be loved and I love loving her! We live on a mountain side and there is still a lot of snow right now. She LOVES the snow! She loves to run, jump, and play in it and she loves to eat it! It is really fun!Izzy is a extremely gentle, extremely smart, and extremely sweet. I had to write the word each time because she isn't just a 'little' bit of any of those. She is absolutely wonderful! !Saraceno Family of Washington State Kim, here are a couple of pix of Shasta. She's been such a good puppy. It was serendipity that brought you all the way over the mountains on Monday so we could get her!Also a couple of short videos if you're interested. http://www.youtube.com/watch?v=uDMzK9EbCKIhttp://www.youtube.com/watch?v=svBlCLKdZaoI'll keep you posted on how she develops.Paula GardnerWASINGTON STATE KimI spoke with you a few minutes ago and thought I would take the time tosend this photo of Bently (just Ben to me) taken in late Jan. when he camehere to Phoenix from Boise. 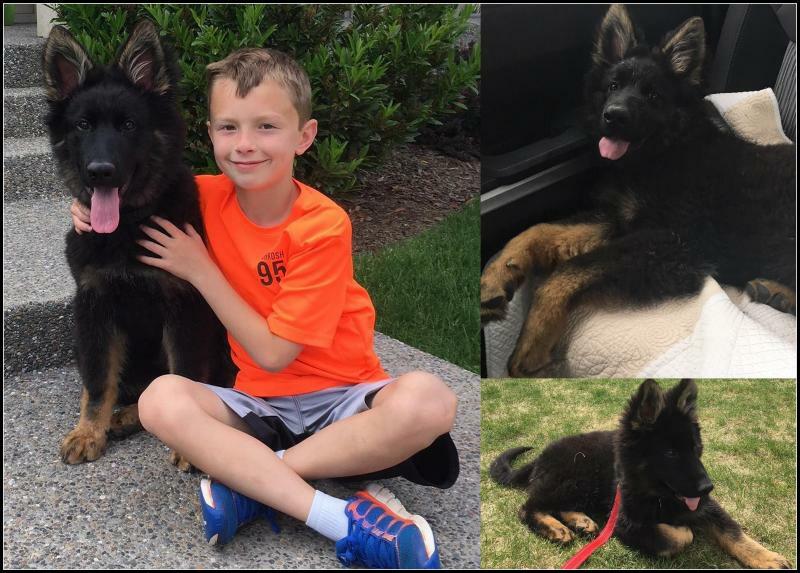 I was just getting to the serious stage ofshopping for a black coated GSD to raise for my own pet and protection dogwhen my nephew T.J. showed me Ben at three months of age. Havingconsiderable more life experience than T.J., I just had a hunch he wasmeant for me. Again, I consider myself so lucky to have him!Maxine( Sydney x Drake male puppy) Hey Kim,Just taking a few moments to thank you so much! BlackJack (Zoey x Drake 2009) is doing fine, being a good boy that loves to be around us (Right now he is under my desk sleeping at my feet). He is growing into a strong and big guy, even if he is still a kid inside. He is now 10 months and a good 85 pounds. He is SOOO active, love to run and to bring balls back. He's favorite activity is probably to run at the flies. He is the little baby of the family and the center of attention everyday. We had many family gattering and other partys and he is always good around people in the house. I started training at 2 months and he is a really promising dog. He learn so fast! He is now in his off leash training! He got houseclean in 2 weeks and has never chewed anything except his toys. This dog changed our lifes for the better!Thanks you so much for this wonderfull dog and for breeding such perfect family pets Kim!Jonathan ( CANADA ) Hi Kim -Just wanted to give you an update on our big baby, Trinity! (Pink girl, Goldi and Boss litter). She is growing like a weed, now 5 months old! Doing great and so smart! She is definitely not as low drive as we thought - some days I think her eyes are spinning circles in her head! But she is a good girl with a good heart! We take her everywhere with us - car, baseball field, dog park. She likes to bark to make sure everyone knows she is there and then she settles down. Since she is the biggest dog at home, she is always shocked to find out that isn't the case at the dog park! She hangs back a bit to see what the other BIG dogs do but mostly she stays near us. She wants to play, she just needs to get her nerve up a little more! At home tho - watch out! She rules the roost! The cat and the two little dogs are her personal chew toys! They don't like it much but what can they do?!?! LOL! Thanks again for everything!Cindi Schultz Hey Kim, Just wanted to take a minute and let you know how much we love Oakley (our Sydney and Drake male). He is doing great..just turned 8 months and is nearly 70 lbs! He had a great winter in Montana, and absolutely LOVES the snow. Pretty sure his favorite thing was throwing the snow around with his nose! He has been nothing but a pleasure to train, Cody swears he is a genius! We were able to train him to sit, shake, "high-five," and roll over in just a couple days. Now that it's summer, Oakley's new passion in life is his kiddie pool-he will play in the water for hours by himself lol. His other favorite thing is playing fetch. He has never chewed or ruined a thing and is pretty much the perfect dog! 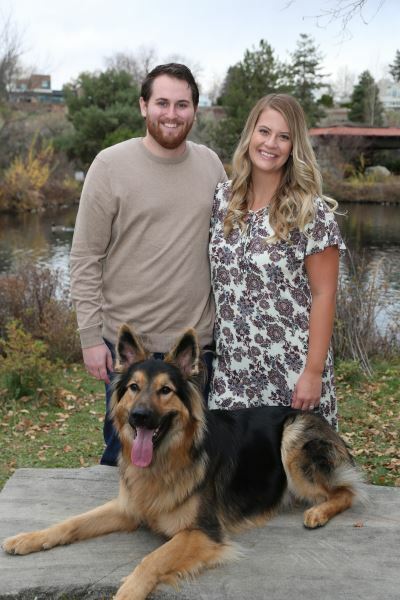 Thanks for being such a great breeder-he was exactly what we wanted in our first german shepherd!Cody, Sydney, and Oakleyfrom Montana Hey Kimberly, So sorry we haven’t talked. Our puppy is fabulous!!!!!!!!!!!!!!!! He LOVES the barn and will not let me go down without him. His is quiet the chewer. Go figure. Went to visit his brother in Atlanta and learned how to play ball. His idea of that prior was keep away. When my kid gets around to it she will send you pictures, sorry I’m not the computer savvy one. Christina’s pup looks just like mine just a bit thicker. Thanks for being a great breeder.Thanks Linda. Sara/Doc Puppy in Florida Kimberly,You are the BEST. Everyone is so impressed with little Al Capone (though, I call him "Allie" and my trainer, Rick wants to beat me for it...lol...he's pretty convinced I'll turn him into a pansy hahahha.) But he really is a GREAT pup. I swear you sent me a house trained dog. As soon as he got off the plane, we opened his kennel (at home) and he ran outside into the backyard and went potty. I was like "omfg, you're a GENIUS. "He was very tired the first day (knock on wood, jetlag does that to the best of us) but he just improves day by day. Every single time he wakes up it's like a new dog. Thursday he was like a little fuzzy water bottle that never moved, Friday he started to perk up and follow me around EVERYWHERE, Saturday he started to take charge and even tried to play with my adult Yorkie, and today he's just better and better. I think you sent me the perfect dog.Everyone is so very impressed with him. He'll be going to the Schutzhund club on Thursday to start "tracking" (you know, the basics) and he's already started his recalls, but we're really spending a lot of time bonding and not doing much. He's very comfortable in his own skin; nothing bothers him. From the washer/dryer, to my neighbors Golden Retriever, to my moms three Pitbulls, he's just like, "Hey everyone, I'm a German Shepherd!" (lol! )He doesn't even mind my overly loud Opera singing (which is quite impressive! haha.) Jackie from Nevada Boss and Goldi Pup Hello Kim,We are having a great time with Morgan! She is so smart (too smart? ), housebroken, leash trained, and having fun. How are the others, gone I hope. Are you getting ready for the triple onslaught of puppies? Is Heather going to be able to help?? Thank you again for Morgan, she is a gem, here is her 9 week picture (the ear did come down). She says Hi !! Glamour / Drake puppy Just wanted to check in. I hadn't heard back from you after sending you Amos's Christmas picture so I didn't know if you got it. If not I will sent it again. He is now about 25.5 inches at the withers and 77 lbs. He is getting bigger all the time. Amos is very sweet, and would love to be a lap dog, too bad he's so big! He is very attentive, and smart. He knows many words and we find outselves spelling things so he doesn't get excited about stuff like dog cookies, or going to feed the chickens before we are ready. He loves "his" kitty (our cat baudicca) she thinks she's a dog. He gives her kisses and brings her toys to encourage her play with him. He comes to work with me and loves to be with the kids. He is very protective of them and if the cry he comes close to them so they can pet him. Amos is a good watch dog and is sensitive to people's emotions. He is very alert which a great feature way out were we live. Thanks Cynthia OREGON - Sydney x Drake puppy thanks so much for our two wonderful girls. they have been the best addition to our family. we have had heidi and honey for just over a year now. i can't imagine life without them. they are gentle, loving and oh, so kind. our 3 year old calls them her sisters. she mauls them constantly, hugging and kissing them all over. they lay there and take it as if nothing were happening. they are the best pets ever. when the car doors are open, they jump in and secure their spots. sometimes they have to get out....what a chore that is. 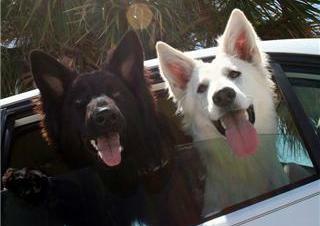 they WANT to stay in the car but sometimes it is just too darn hot to take them. they are the truest of family pets, constantly following or chasing the kids all over. heidi loves football. she drives the boys crazy. when they are throwing the ball, she is right there trying to catch it.. she also loves to chase bees and various other bugs, chasing them for hours.....honey is the mischievious one. she teases heidi and the chase is on.....that is one of her favorite games;having her sister chase her all over the property. by nighttime the girls are ready for bed, heidi always first in her crate. they love their crates. i was hoping to have them done w/the crates by now.............i don't know that it will ever happen though. they really enjoy their beds when it is time to sleep. i can't say enough about our furry girls.......they are everything that you said they would be kim.....and much more. i have to say,,, i think i maul them as much as our 3 year old......thanks so much for breeding such amazing pets. bill and michaele janacaro and kids. will send pics soon JANACARO FAMILYMONTANA THEY HAVE 2 SARA/BOSS SISTERS FROM THE SAME LITTER Hi,The puppy is doing great, and growing! We have given him the name Darth Weber (sounds like: vaber)( Black Collar Zoey/Doc Male from 2009 litter ). When we first brought him home he was attached to me at the hip. He continues to be my little shadow, but is okay to wander around on his own now. He likes to curl up on my feet when I do dishes or fix dinner. He loves to play with the boys! They chase each other around until they collapse. I love to watch how happy he is running around with them! He also loves to take walks. He is one smart puppy. I am amazed at how well he listens! We are going to enroll him into K-9 classes for obedience. I think he will excell, and it will be good for the boys to learn how to deal with him (other than play). We are so happy to have him! I have enclosed a few pictures.The CoolingsVIRGINIA Kim and Matt,We are so lucky to have not one, but TWO, GSDs from Patchwork Shepherds! We purchased Pruett (black collar male from Zoey x Doc August '08 litter) and were so thrilled with him that we had to get another! A few weeks later we welcomed Daphne (hot pink collar female from Anna x Doc August '08 litter) into our lives. This dynamic duo brings joy and happiness to us every day. They are smart, trainable, loveable and beautiful! We get compliments on both of them everywhere we go. We couldn't ask for better dogs!Pruett is very eager to please. His work drive makes him an active participant in everything we do. He adapts quickly to new situations and people. He is great with small children, puppies, cats, and loves car rides. He quickly learns new commands and we are currently practicing, "seek", where we will tell him to "sit and stay" and then we go hide his ball and tell him to "seek" and he finds it. He loves to play fetch and tug of war. Although active during the day, he is an amazing snuggler at night. Best,Evan, Christina, Pruett and DaphneNORTH CAROLINA Check out Pruett and Daphne's Blog at http://www.gsdadventures.com Hi Kim!Sorry it has taken me so long to update you! We have been really busy with the holidays! I hope you and your family had a good Christmas! Tymber has been doing great! She enjoyed Christmas a lot, but it really wore her out! She was pretty pooped by the end of the night! She loves to play in the snow! !She has been doing really well in the house, she is a very quick learner. Both Tyler and I's parents have all said that they can tell she is really smart. I know the "puppy stage" lasts for awhile, but if it continues to go as smoothly as it has been going, it will definitely be a breeze. I also wanted to remind you about how good she is at playing fetch! You told me she was when we came and got her, and you were right! She loves to play fetch and she is really good at it, which is surprising to me for her age. She is such a sweet puppy, she is always trying to make friends with all the animals she meets, most which unfortunately haven't been too fond of her. She is persistant though. She gets fustrated with Tyler's parents dog whom does not like her at all. She wants to play so bad so she jumps around and barks at the other dog (Miah). Miah is starting to be a little friendly, not much, but like I said, Tymber is a persistant little pup and I believe that eventually they will be pals. I can't say enough good about her. We will be taking her on her second fishing trip tomorrow, which is always very exciting for us. On the way home from Idaho we went to the Owahee river and she did really well. She mostly liked drinking the water and playing in the grass. She loves playing with any kind of plants and grass- we are hoping she grows out of that stage for our landscape's sake! haha! But she always finds a way to entertain herself. Anywho, I just wanted to let you know what a great pup she is and how much Tyler and myself enjoy having her. You can probably expect in a couple years we will be getting her a little brother! =)I will attach a lot of pictures I have taken in the past 3+ weeks that we have had her! Take care,Vanessa & Tyler Sara/Boss Female in Oregon I wanted to thank you for such a wonderful pet. He is everything I could have ever hoped for in a German Shepherd and I am really happy that I got him. He is perfect! Thank You! -Cynthia Idaho Hi Kim, I thought you might enjoy an update on my little buddy, Cooper. First of all I want to tell you that Cooper might be the smartest dog I've ever owned. That's saying a lot because I've had some pretty smart fellows! He was ringing a bell to go out by 8 weeks old. He was also doing a consistent "sit" and a semi-consistent "stay" by about 10 weeks old. He is 4 months old now and we are about to finish our Puppy 1 class. In class he overcomes distraction very quickly and does what he's asked to do. He's also very sweet natured and has helped a number of pups to come out of their shell. Several people in our training class have commented on his lovely conformation as he trots across the room while playing with the other pups. Cooper spends his days playing with his big sis, Gwen (the lab) and an assortment of toys. I've noticed he tends to put himself "to bed" at might if I stay up too late for him! He really is a joy to have around and I'm so glad he's here! We are going to continue with training. I hope to get his CGC and also pursue agility. Last week we went to the vet to get another round of shots plus rabies. My vet had originally said he didn't expect Cooper to get past 60-65 lbs. Well, after he saw the size of his feet he changed his tune! Time will tell, but I don't really care how big Cooper gets. He's a great dog! Anyway, hope all is well in your part of the world and that you are enjoying the holiday season. You can bet I'll send you more pictures in the future...and that I'll be calling you next time I'm looking for another dog! Take care!-Carolyn MONTANA Dear Kim: Our new addition Destiny ( Anna x Doc Yellow Collar )is doing great! But she has started to cause issues in our home . Everyone that sees her wants to take her with them.This has become a real issue! My sister fell in love with her and dog napped her for the day LOL. Dr. Bob FLORIDA Hi Kim, Well Mr. Green (now known as Argus) made it back to Montana and has settled in very well. Although I had some concerns on how Gracie would react, from the first walk that we did on the way home from Patchwork, she has been wonderful. I wouldn't call her Ms. Mom but definitely tolerant big sister fits well. Already they play together, with Gracie laying down so that she is on Argus' level, letting him crawl all over her. She is being such a good girl. Argus is very smart, (okay I am a proud mom). He already knows his name, figured out how to negotiate the step up the deck, and how to run from me when he picks up something I don't want him to have. He follows us around from room to room and always sleeps next to us when we are in the room. I do have a crate and have used it but not very much, mostly I just watch him and when I catch that certain look I just take him out and tell him to go potty. He almost always does it right away. Last week I took him to work with me and he was very good. When I was in shop he would play under my bench and when he was tired he would sleep under my stool. When I had to go to a customer site I would put him in his crate and leave him in the car. He did very well. He has met many new people both at our work places and around the neighborhood. His ears are starting to stand up and he weighed nine and half pound as of last night. As you can tell we love him already and are very pleased with his temperament and cute polar bear looks. UPDATE .... Here are some pictures of Argus from the first week we brought him home. He has grown a lot and I will post the most recent pictures soon. He weighs 12 pounds as of last Friday. He is the most wonderful puppy and has a very happy outgoing temperament. He has gone on his first hike. Last Thursday on a beautiful autumn day we went for about a two mile walk in the woods. He did very well, even though we did carry him a few times. I take him for a walk everyday around our property. We also went on lots of car rides and he is doing very well. He does not cry or have a problem with car sickness. Yesterday we were up in the woods all day getting firewood. He and Gracie had a good time exploring and finding just about every kind of poop there is out there. So Argus has definitely made himself a place in our home and in our hearts. We love him!The BentonsMONTANA Hi Kim,I just wanted to send a note to thank you so much for breeding such great dogs! I purchased Saubay out of your Boss / Saratoga litter. She is one very special canine. Everyone that meets her is in awe of not only her beauty and structure, but even more so of her super sweet and willing disposition. I cannot say enough about her. She is very gentle, smart, intelligent, super athletic, and just wants to please and love everyone. She loves to crawl into our laps and pretend she is a tiny lap dog. She is very gentle with small children and older seniors. She also loves to mother my 3 year old male GSD. She is constantly bathing him with her tongue and watching over him. She is fun to play with as she is so agile. Once we finish 3 levels of obedience training, we will begin agility as she will excel in it. We are about to finish Level I obedience and she will graduate within the top 2 spots of the class. Next month we plan to have her certified as a therapy dog. She will do very well with this as we feel she will make many people happy that are seriously ill both mentally and physically. She will accompany my 3 year old male as he does the rounds at the hospital and the mental institution. He brings a lot of joy to people that are depressed about their situations and I am certain that she will bring happiness to those patients as well. Again, I just wanted to thank you so much for your meticulous breeding program as Saubay has exceeded our hopes in our search for the perfect 2nd dog. We have a lot of plans to share the love and good nature she gives with those less fortunate. Sincerely, Jeanice NelsonIllinois Dear Kim and Matt –Well, what can I say? Not nearly enough!! Harley has been the most wonderful addition to our little family! His big brother Jackson and he are the best of buds, they have really bonded into something special! Harley is very smart, and learns things quite quickly. He loves to play fetch and of course, “keep away” from us when he’s feeling a little mischievous. He is such a happy dog, and he really keeps our older shepherd exercised (as well as us) as they romp and play whether it be in the backyard, up in the mountains, or anywhere. My folks just love it when we bring the “kids” up to their home to visit. Harley definitely has his “Gramma” wrapped around his paw! Harley is such a gentle, loving, and energetic spirited dog, he keeps us all going and extremely happy, we are so thankful for that! Also, we’d like to thank you for letting us come out and see him when he was a puppy, and for giving us little updates on how he was doing when he was just a lil’ guy. (10lbs when we picked him up to take him home seems little compared to the size he is now! Ha!) He looked just like a little bear cub when I came and picked him up to take him to his new home J I have had so many comments on what a beautiful dog Harley is, and I’m so proud, and I let each and every person who asks know exactly where I got him from and how to get to your website! You are so informative, patient, and knowledgeable about your dogs, and it’s so neat to be able to meet someone who is so passionate about the breed! I think its wonderful that you guys treat each and every lil’ guy and gal pup just like family, an that we have the ability to contact you and share with you how Harley is growing, and doing, I’ve never been able to correspond with a breeder after buying a pup before, most just sell the dog and that’s all, you never hear a word from them again. Who you are and what you do is extremely appreciated far more than you know! We’ll be sending you more pictures of “Harley’s Adventures” soon!Thanks so much! !Mandy, Mike, Jackson, and Harley SuchanIDAHO We spent along time searching for the right place to adopt our new family member from. I had never really owned a purebred dog before and my husband was used to having boxers. After working for a vet for more then 10 years my husband had to really talk me into getting a GSD. I am thankful I did it now. I do not know what my life would be like without Cheyenne. From the start she was smart, outgoing, and confident. She keeps up with us on horseback. From day one we did not have trouble potty or crate training her. I take her everywhere with me. It has come to the point if she's not allowed to go, I won't go. The last year as been exciting and fun. She has gone though a basic and advanced off leash obediance class and this comming year brings more fun with tracking and agility classes signed up. We are now thinking of getting her a little brother and look forward to coming out to visit and meet more parents. Thank you for giving us a happy and healthy puppy that has turned into a wonderful dog. Janel and Todd Whitaker IDAHO Dear Kim and Matt,"Thanks to "the Stork"Freshly Renamed "Rama" is simply the best,There isn't a person he's met, that he detests....Your pic of Boss and Sara's litter , so special and sweet....first had trouble finding the family, he was supposed to meet.We found him as "Briscoe" on your Older Puppy Page, and went head over heels....but let him slip through our fingers and wreck the deal....I was set on a younger puppy, they had to be 8 weeks or less...I figured a returned puppy would be someone else's mess.So the dreaded wait was on for a pup like Briscoe,Then you gave me the magical call and out the door we did go!The stork brought Briscoe back a second time, it must have been a twist of fate...and now thanks to Patchwork Shepherds we have found our SOUL MATE!Rama is the coolest puppy and he had HUGE shoes to fill,He has done nothing but given us thrill after thrill.He was very well socialized and potty trained too, Anyone with hesitations on an older puppy, should PUT THEIR TRUST IN YOU!!! !We can't wait to get our next puppy from Patchwork, your dogs are worth their weight in gold!You provide beautiful, intelligent German Shepherd Dogs, Regal, Healthy and Bold!Rama is doing great! He is just shy of 21 weeks and weighs a whopping 44 lbs! He is adapting quickly to his new home on Orcas Island, WA and after 3 days already knows his new name. He is just the nicest German Shepherd Puppy I have ever met. He wants to meet and be friends with everyone. Everyone LOVES him. Thanks soooo much for this amazing blessing! Please feel free to have anyone call us for a reference. Jacob and Kristi Angel Washington State Kim,I just wanted to give you a quick update on pink - whom we have named Princess Anastasia Titiana Patchwork. ( Sadie x Doc Female ) She is doing great and our other dogs love her as much as we do. She is playing and sleeping - doing everything a puppy should. I have been telling everyone that I introduce Ana to - where she came from and what a great start in life she had. I sent a few pictures....Thank you for bringing Ana into the world so she can change ours.The Stansell FamilyIdaho State Dear Kim & Matt, What can we say about Samson (Doc & Anna puppy)? He is perfect and wonderful. Thanks to all of your hard work with him before we picked him up at 8 weeks old he already knew his name and was mostly potty trained. We have had him 4 weeks now and he knows come, sit, shake, gentle, no and is working on wait, stay and load up. He walks on the leash with no problems and recently has been walking very short distances off leash as well. Samson is an extremely smart puppy and has learned things very quickly. He especially likes to tease Karla’s mom by going up and putting his mouth on her blanket and tugging just enough to get her attention. When she looks down and tells him no he grins at her and dances away to his own toys, then lays down and chews on them the whole time grinning like “I got Grandma”. He has become fast friend with his “Aunt Holly”, Karla’s mother’s dachshund, and enjoys playing with her and rolling her out of the way when she is being obnoxious. He never tries to hurt her and the other night we swear he was giving her a hug. He loves “helping” Roymow the yard. Especially the clean the lawnmower time with the water hose at the end of mowing. He loves water but still isn’t too happy about bath time. Guess it is a boy thing and has to be his idea. We love our little boy and are looking forward to getting him a little sister in the next year or two. We would recommend you to anyone who was looking for a shepherd for a dog. Your patience with us as we came out many times to look at and hold our new baby was wonderful and your facilities are safe, secure and a great place for a puppy to grow or an adult to live and thrive. Thank you so much for our precious little boy. Karla & Roy in IDAHO Dear Kim and Matt,Thank you so much for allowing us to adopt Kodiak. He is a wonderfully kind, smart and calm puppy from a Boss and Sidney litter. We have had him for two days now and he has already learned his name, learned how to come when called, walks great on a leash, has learned the command "gentle" for when he takes things with his mouth, is completely potty trained and sleeps all night long in his crate with no problems. He is a dream come true. He is extremely gentle with both our two year old and our cat. We have never seen such a loving, well behaved, intelligent puppy before and we feel so lucky that he is now a part of our family. We can't thank you enough. The Randall's IDAHO Dear Matt and Kim, We are so thrilled with our two puppies, Sebastian (blue) and Kasia (red), from the Ivy/Cayden litter. We were so impressed with the puppies and their parents. You make sure that you provide the safest environment for your animals. John and I were so pleased to see the safety measures that you take prior to letting anyone be near or handle any of the puppies. Because of your loving care for your dogs we now have two of the greatest puppies that anyone could ever ask for in life! I am grateful for the time that we were able to spend with the puppies getting to know each and every one of them. However, it also made me want them all! We check your website frequently to see the pictures of all the beautiful puppies. You are wonderful about keeping everyone informed through your website just as you did while we were waiting to be able to take the Sebastian and Kasia home. We were also very impressed that you were so willing to let us come visit and you even encouraged us to do so. We thoroughly appreciate that you allowed us to be a part of the puppies lives even before they were in their new home. Through your attentive behavior to each and every one of your puppies we new the silly things they did, what they liked to play with all the way down to their little itchy spot that they liked to have scratched. You two are the best by far! We will definitely get another puppy in the future. We could never imagine getting a puppy from anyone else. The two of you have wonderful, healthy puppies and dogs that are part of your family! Because of all your love and attention we have two beautiful, healthy puppies that we will get to love for years to come. Thank you so much for our beautiful puppies! We will send more pictures of Sebastian and Kasia playing in their new home. Respectfully, John and Karen WASHINGTON STATE I have attached a picture of Sailor at the beach. She has just finished digging a big hole and is very satisfied with herself. I want you to know that she grew up to be a very special dog. She is 11 months old now and is as smart as anything. She is also kind and the kennel where she goes says that she is the best daycare dog they have ever had. She is either the little sister or big sister, depending on what her friends need her to be. We are having her trained by the same kennel owner, one on one, and he tells us that she is an amazing dog. She is brave and confident and learns new things very easily. So just wanted you to know that all is well and we are very happy with her. I hope your business is going well and that you are happy and well in your new home in Idaho. The Austin Family WASTINGTON STATE Kim and Matt,I didn't really believe it could be done when I set out to find a dog like the one we had just lost, but without the fear/aggression. I got hopeful when I found your pages, with your dog Penny, who reminded me so much of our Isis, who was a beautiful, athletic,and loving black and red blanket pattern longcoat. You DID say on your page that your goal was to find the right dog for people, right down to the color. But I never REALLY thought you could...You couldn't have been more helpful in listening to what our dog had been like, and advising about which litters might be best. The way you described the parents of different litters, and later the pups themselves, was exactly right. Patiently, you discussed all the little characteristics of each pup in a way that just about made up for our never being able to actually see the pups in person or hold them in our arms. Plus your weekly picture updates helped tremendously. It was a blast to watch as the pups changed so drastically into the beauties we eventually picked up at the airport. Pashi (Maverick/Ivy ) and Itta (Boss/Sidney) couldn't be more perfect for us. They are the most trainable dogs we've ever experienced. Pashi learned every trick all of my other dogs know in one 10 minute session at age 11 weeks, and never forgot them. She and Itta (9 weeks) both sit at the door automatically now, better than any of our other dogs who have been working on it for ages. They also attract a lot of attention when we take them out, with their beautiful unique looks and long coats. It's so much fun having dogs that are truly one-of-a-kind and yet have the temperament described in the standards for a GSD.Thank you for bringing so much happiness back into our home and renewing our faith that there are great longcoat GSD breeders out there.You guys are awesome!Kristin and Larry LevineNew Hampshire Hello Kim and Matt,We just wanted you both to know how wonderful it is having Lucia in our lives. Not only is she beautiful, but she has a great spirit as well! She is a super happy puppy and so incredibly intelligent. We were at our first night of Agility tonight at the dog club and at the end of class, a man said to me "That is one very bright pup." He and his wife were very taken by her. She learns very fast and I don't think there is anything she couldn't be taught. She really enjoys the daily walks in the woods, investigating all there is to see and sniff out what wildlife might have passed through the night before. We cannot wait to take her to the lake for her first time swimming. I'm sure she'll love it! She is fearless and an adventurer at heart. Thank you both so much, we love Lucia! 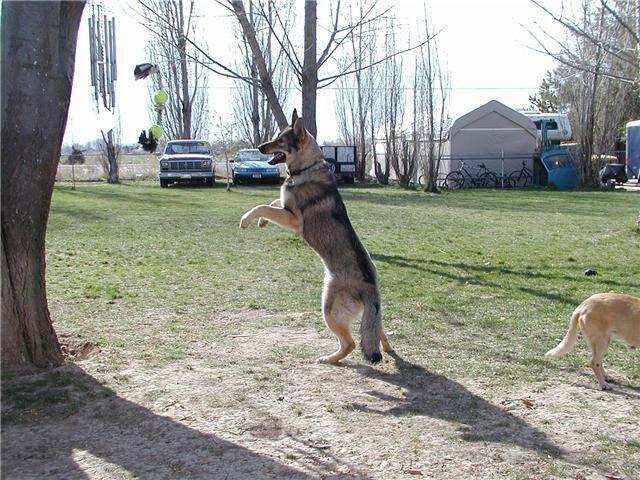 We will keep you posted on her Agility as well as her upcoming Obedience classes. 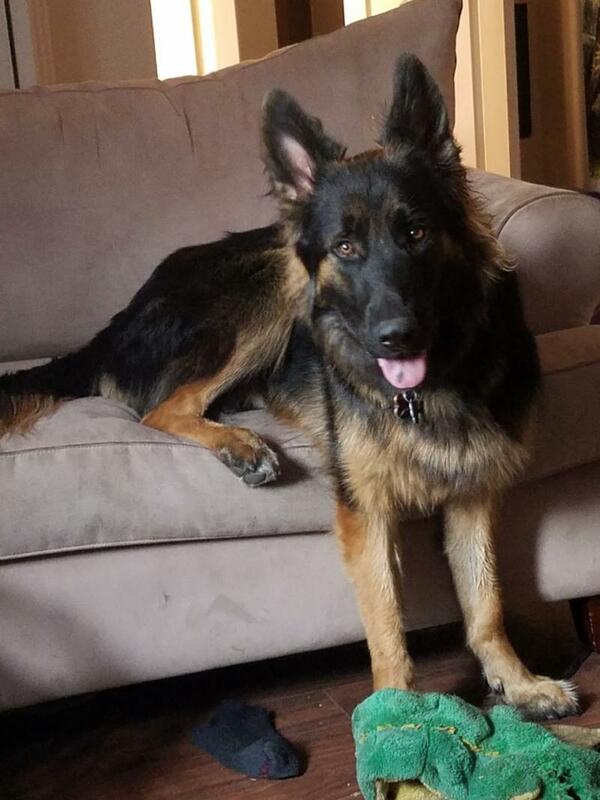 She is very special to us!Anna, Ric, Vito and now....Lucia too!MICHIGAN Hi Kim and Matt!I just wanted to send a note letting you know that Samson is doing great in his new home. We love him so much already and feel he is the smartest dog we have ever seen! :0)Here is one of the pictures that Matt took as we picked Samson up on Sunday and another one that Steve took that same day when we got him home. We'll keep in touch and let you know how he continues to grow! 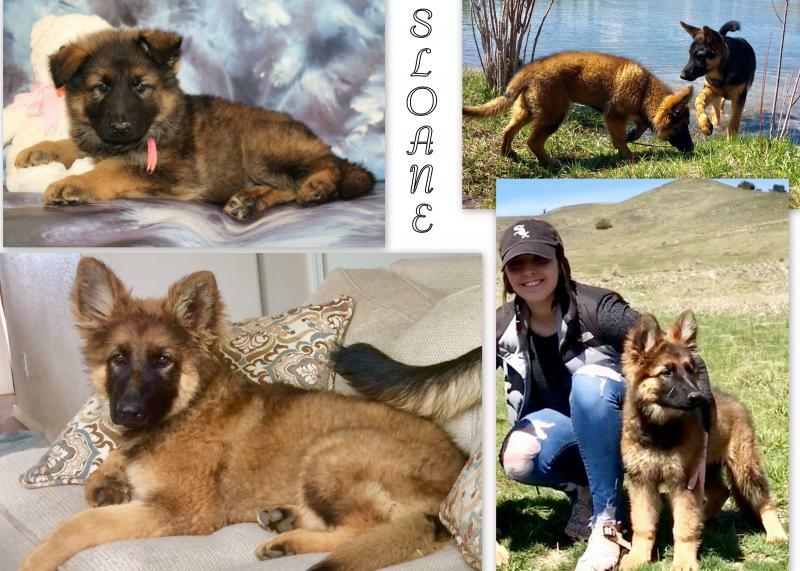 Thanks again for everything!The Landers FamilyBoss x Sidney Male puppy named Samson lives in Boise Idaho! kim and matt,We love her, she is so sweet and she is doing so good! She drinks lots of water and eats her food. she goes potty when we take her outside to go. She is learning to run after the ball with Angel(STD Poodle) She did not cry during the night. She even walks on a leash. She is truly "MAGIC'! She loves to put her paws in the water bowl. Rick took her this morning down to the front yard on the lake and she went to the boat launch and picked up a stick, soon she will be a water dog jumping off the dock. She will take her first trip to Eastern Washington this weekend with us, she will like the 60 acres of forest we have. I am sure there is snow so I don't know how much we can be outdoors. We are a stones throw away from Lake Roosevelt so she will have water over there also in the summer to play in . She is a lucky dog! and we are lucky owners!I want to thanks you for breeding such wonderful pups and the pictures you took of the litter and Magic our priceless.We will keep in touchThe Luthers Washington State CHECK BACK FOR MORE TESTIMONIALS !!! Thank you to the many families that provide a wonderful home for our puppies and a special thank you to those who update us with pictures and stories of their dogs. We appriciate those so much. I have over 28 years of GSD experience with my own dogs as well as being involved in rescue as well as training. It's my passion and I was thrilled to meet Kim who shares this same passion for this amazing breed. Choosing a good breeder is a difficult process especially when they are located in another state. Do your due diligence and I'm certain you'll find Kim's breeding program exceeds most others in the US. The quality of her dogs is just amazing. The prices are affordable and there's no limit as to what you'll be able to do with your pup. Not only is Kim available for calls and texts, but she also provides many pictures each week of each pup. This is such an exciting time and you'll be part of the process. You will be able to see your pup grow each week. Details about each pups progress with be provided so that you will be able to select the pup of your dreams. In August of 2017 I got Kodiak (Kody), a Britta/Ryker pup. He was, and still is, such a happy pup. He loves people and because of his experience with Kim's children, he adores kids. 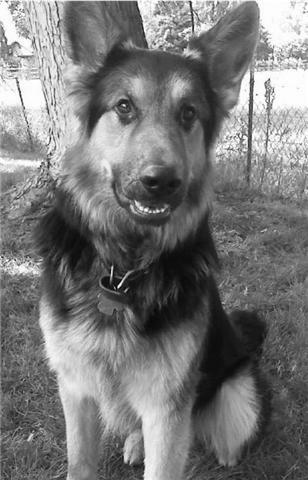 He completed Obedience Classes and went on to more specialized training. To date I have yet to find anything that he can't do. He's just so intelligent. When you look at Kody you can see he is a well bred GSD. His structure and gait are perfect and his coat is long and luxurious. His temperament is rock solid and he is trustworthy in any situation. He also enjoys an occasional day at Doggie Daycare where he is good with dogs of all sizes and breeds. Recently it was time to add another pup to my family and I immediately called Kim. Once again it was an amazing experience. I loved the weekly pictures and all the updates. I got Sasha (Lizzie/Cap) last week and I couldn't be happier. She really is the pup of my dreams. She's confident and just a happy go lucky puppy. I'm so thankful I found Kim and Patchwork Shepherds. If you want a more personal recommendation please feel free to contact Kim who can give you my phone number or email address. Hi Kimberly, I wanted to let you know how happy and complete our family is now with the addition of Max. He is a big strong dog, yet so gentle with our girls! He is so lovable, loyal, and friendly. We couldn't be happier. Thank again!! It’s been an absolute pleasure, we look forward to a long doggie relationship. The portrait was taken professionally at our clubs recent training seminar held in Missoula Mt. Mary Jane Shervais is a trainer and long time dog show judge out of I believe Spokane. She came to teach on obedience, rally and agility techniques and the changes to AKC Rules and Requirements for Titles starting in May. Wyatt was so good at his very first event. Everything was new to him, but he watched and took it all in and was so well behaved for a baby. He was the youngest dog by far. Mary Jane said he showed great promise and she was sure he would do well. Wyatt enjoys romps with our Sheltie, Annie Oakley, and loves to learn new things. He is a real problem solver and thinker too. We love his playfulness and he has such a soft mouth so playing with him is easy. Perhaps one of Wyatt’s most endearing traits is that he takes everything in stride. He is not bothered by new sounds, sights or animals or people. This pup just takes it all in and carries on. He is focused and so intelligent. I love the way he seeks my company and chooses to lay at my feet any chance he gets. Wyatt is a cuddler who also loves car trips and I take him everywhere I can. I look forward to adding a female from Patchwork Shepherds to train and show both alone and as a Brace with Wyatt. Kimberly and Patchwork Shepherds, thank you so much for your dedication to the GSD. Wyatt really catches attention wherever he goes and he always seems to be smiling and happy. He is amazing. We love him. In the Spring of 2017, after losing several of my beloved dogs, I started searching for a German Shepherd breeder to adopt a new family member. I knew exactly what I wanted so I had to go through a lot of breeders all over the country before I found Kim at Patchwork Shepherds. Her personality, her knowledge, her dogs, and her priorities in her breeding program checked all my boxes and I knew we were a good fit right away. After agreeing on which litter and which puppy (Maya/Cap female born 7/22/2017), she kept me well informed with the progress of the pups and sent weekly photo albums. Not just a picture, but a bunch of pictures, which I just loved and waited anxiously for them each week. She was always available to answer questions and share her extensive knowledge with me, which was very impressive. When it was time to ship my pup to me, I live in Pennsylvania so the pup had to go to Newark, NJ airport, she worked really hard on getting the best flight for my baby girl. When it got cancelled because it was too hot on one end, she worked really hard again to get the next best flight without making me wait much longer because she knew how disappointed I was. When the pup was on her way here she was on the phone very early in the morning on her end to check and make sure all went well. When I received my new baby I was please to see after quite a long day of being in the crate and all the scary new stuff she had just experienced she came out of the crate ready to play. She seemed no worse for the wear. The vet check went perfectly, my vet was very impressed with the health, temperament and, of course, the beauty of my new family member. I couldn't have asked for a better experience and a more perfect puppy, in fact, I am getting another pup from her right now. I have between 7 and 8 weeks to wait.......not sure I'll make it, lol!! Can't wait to get my next baby from Kim at Patchwork Shepherds. Thank you and keep up the good work Kim! Just wanted to let you know how Brody is doing. Best dog I have ever had. So smart and his temperament is just awesome! Thank you again. Merry Christmas Kim and Family! We got the green collar male from Tatsu and Myah’s litter in December of 2014. I can’t believe it’s almost been 3 years! I came across his contract the other day and thought I’d send you an update! Oakley is the BEST pup!!! He has such a sweet and fun personality. He is the best family dog and we couldn’t be happier! He loves to ride in the car, swim, hike, play with other pups, play Frisbee, cuddle on the couch (he thinks he is a lap dog…and we let him be), and his pup cups from Freddy’s! J All of our family and friends love him so much that we have actually had 2 friends, 1 co-worker, and 1 neighbor get puppies from you in other litters! We get stopped all the time and asked where he is from. He really is such a handsome and loving boy. Thank you so much for Oakley!!! He is more than we ever hoped for! I’ve attached a few photos for fun. I hope you have a wonderful holiday season! Loki is the sweetest most caring puppy I have ever had, he is always finding new ways to brighten up my life. He is so incredibly smart and aware of how I am feeling, whenever I am upset or anxious he will not let me be until he sees me smile, he will sit there and act like a total dork, rolling around and kissing me to be sure I am okay. I could not see my life without this special boy, he loves water and playing with children in the water throwing his front paws up to splash them. Even though he is such a big puppy he is so gentle around people and animals that are smaller than him. Everyone I've ever met just adores Loki and his bubbly and dorky personality. Loki isn't just a dog, he is my son. My sweet loving, smart, incredible son. He love's his mom so much he follows me everywhere I go with his big dorky smile on his face. Whenever he's not around I feel lost, he is like my emotional support dog, I need him in my life as much as he needs me. I am so grateful to have such a wonder beautiful dog in my life and I'm so thankful to patchwork shepherds for doing all that they do and bringing this wonderful gift into my life. Our pup, Kaytu (Kora x Tatsu), named after the second tallest mountain in the world, K2, one of the most adventurous and dangerous mountain to climb, lives up to her name as she is always ready to face whatever challenge is before her whether it be chasing a frisbee through the trees, swimming across an icy mountain river, riding a boat, or pulling a bike as fast as her little paws can carry her. We are so thankful we found Patchwork Shepherds. Having never met a dog or human she doesn’t like, Kaytu always wants to be in the middle of the action whatever that may be. She completed her first two camping trips this year as well as road tripping internationally to Canada. Her absolute favorite thing to do, however, is frisbee golf. As soon as the frisbee leaves your hand you’ll hear her yipping happily the whole way after it. When you finally catch up with her, she will be standing proudly over her prize and waiting patiently for you to throw it again. Thank you Kim for our wonderful pup! She’s everything we hoped she’d be and more. Keep up the good work! Here is my Echo at 6 Months...I just wanted to thank you for such an amazing pup! 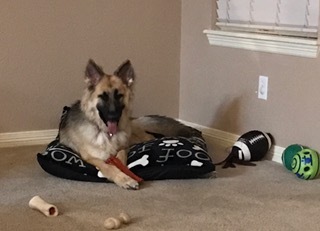 He was play pen, crate, and bed time trained...He is so smart and willing to do whatever I show him...he even knows to go drink when I say water...I hope you will continue to provide such quality shepherds and wonderful additions to family's for years to come! I will be a repeat home for your pups...believe me! I really could go on but I'll just say...by his 1st month Echo would sit, stay, come, get in the house, knew cookies where treats, lay down and wait for his meal...the 1st time I told the dogs (his sister Reese a 2 year old Great Dane and his brother Titan a 5 year old boxer) to go lay down and Echo at 10 weeks beat them both to their spot laying down... he got some huge praise and cookies 1st, the others of course got theirs just after Echo LOL! I know he is dedicated to me and the most loyal companion! When I think of bringing Echo home...I am so very great full and know he is that dog that will be remembered for the years to come even after I have to eventually say goodbye...I have had dogs since I was 18 years old and I've had 3 dogs in my life that there has been such a bond between them and I and Echo is the 3rd and I'm now very close to 55...I've loved the other dogs I've had through the years of course but dog people know what I mean about that special dog that even years after they've left this earth the love and memories are still so very strong in our heart and mind...so I just wanted to Thank you for my boy!!!! Have I mentioned not only is he amazing...he's gorgeous! Thank you, thank you!!!! We wanted to express our gratitude for making the puppy buying experience pleasurable. The attention to detail, up to date emails and the timely replies are a true testimate of your character. Despite the 2700 mile distance, we never felt uninvolved. Being compassionate and tolerant during our decision stage, only strengthens our confidence in Patchwork. Thanks for understanding of our family dynamics, it has given us assurance; we found the right breeder and perfect quality puppy. On a side note, We are apologetic for any inconvenience or interruptions we may have caused you and your family. Please extend our gratitude and acknowledgment to your family. With sincere Thanks from a family filled with excitement, THANK YOU! Looking forward to providing the Best Family Life for “Yellow”. Isolde is a WONDERFUL dog. But we knew that from the moment Rob picked her up. He said, "she is really a love," and described her gentleness and cuddling even from the get-go. And she IS a love. She is very playful with her 'brothers' (two older choc labs), but is extremely responsive to me and is my 'watcher.' No matter where I am, she is watching over me. When I go to another room to do laundry, she quietly follows and lays down to watch. I move back to the kitchen, and she is there again with her watchful eye. When we settle in the evening to watch a movie, she will quietly peruse the house, coming back to my side after she has checked everything out. Does she know how big she is? No, I don't think so! 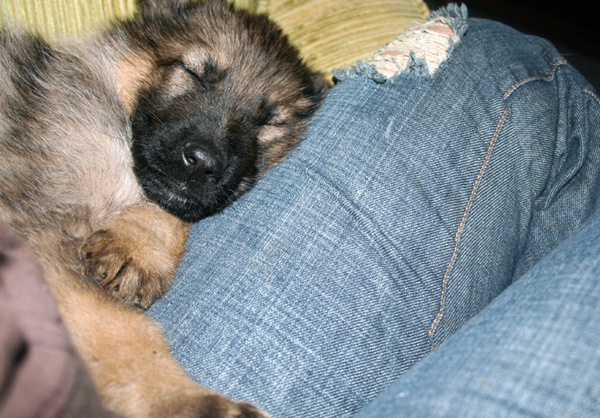 If she could, she would hop up on my lap and sit there, just as she did when she was a fuzz-ball pup! She just loves to be loved and I love loving her! We live on a mountain side and there is still a lot of snow right now. She LOVES the snow! She loves to run, jump, and play in it and she loves to eat it! It is really fun! Izzy is a extremely gentle, extremely smart, and extremely sweet. I had to write the word each time because she isn't just a 'little' bit of any of those. She is absolutely wonderful!! Kim, here are a couple of pix of Shasta. She's been such a good puppy. It was serendipity that brought you all the way over the mountains on Monday so we could get her! Also a couple of short videos if you're interested. I'll keep you posted on how she develops. Just wanted to give you an update on our big baby, Trinity! (Pink girl, Goldi and Boss litter). She is growing like a weed, now 5 months old! Doing great and so smart! She is definitely not as low drive as we thought - some days I think her eyes are spinning circles in her head! But she is a good girl with a good heart! We take her everywhere with us - car, baseball field, dog park. She likes to bark to make sure everyone knows she is there and then she settles down. Since she is the biggest dog at home, she is always shocked to find out that isn't the case at the dog park! She hangs back a bit to see what the other BIG dogs do but mostly she stays near us. She wants to play, she just needs to get her nerve up a little more! At home tho - watch out! She rules the roost! The cat and the two little dogs are her personal chew toys! They don't like it much but what can they do?!?! LOL! Thanks again for everything! Just wanted to take a minute and let you know how much we love Oakley (our Sydney and Drake male). He is doing great..just turned 8 months and is nearly 70 lbs! He had a great winter in Montana, and absolutely LOVES the snow. Pretty sure his favorite thing was throwing the snow around with his nose! He has been nothing but a pleasure to train, Cody swears he is a genius! We were able to train him to sit, shake, "high-five," and roll over in just a couple days. Now that it's summer, Oakley's new passion in life is his kiddie pool-he will play in the water for hours by himself lol. His other favorite thing is playing fetch. He has never chewed or ruined a thing and is pretty much the perfect dog! Thanks for being such a great breeder-he was exactly what we wanted in our first german shepherd! So sorry we haven’t talked. Our puppy is fabulous!!!!!!!!!!!!!!!! He LOVES the barn and will not let me go down without him. His is quiet the chewer. Go figure. Went to visit his brother in Atlanta and learned how to play ball. His idea of that prior was keep away. When my kid gets around to it she will send you pictures, sorry I’m not the computer savvy one. Christina’s pup looks just like mine just a bit thicker. Thanks for being a great breeder. 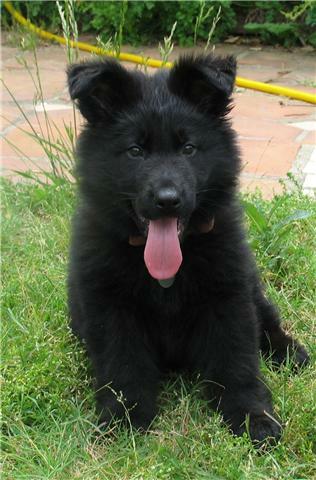 gem, here is her 9 week picture (the ear did come down). She says Hi !! I wanted to thank you for such a wonderful pet. He is everything I could have ever hoped for in a German Shepherd and I am really happy that I got him. He is perfect! I thought you might enjoy an update on my little buddy, Cooper. an assortment of toys. I've noticed he tends to put himself "to bed"
around and I'm so glad he's here! gets. He's a great dog! My sister fell in love with her and dog napped her for the day LOL. Well Mr. Green (now known as Argus) made it back to Montana and has settled in very well. Although I had some concerns on how Gracie would react, from the first walk that we did on the way home from Patchwork, she has been wonderful. I wouldn't call her Ms. Mom but definitely tolerant big sister fits well. Already they play together, with Gracie laying down so that she is on Argus' level, letting him crawl all over her. She is being such a good girl. Argus is very smart, (okay I am a proud mom). He already knows his name, figured out how to negotiate the step up the deck, and how to run from me when he picks up something I don't want him to have. He follows us around from room to room and always sleeps next to us when we are in the room. I do have a crate and have used it but not very much, mostly I just watch him and when I catch that certain look I just take him out and tell him to go potty. He almost always does it right away. Last week I took him to work with me and he was very good. When I was in shop he would play under my bench and when he was tired he would sleep under my stool. When I had to go to a customer site I would put him in his crate and leave him in the car. He did very well. He has met many new people both at our work places and around the neighborhood. His ears are starting to stand up and he weighed nine and half pound as of last night. As you can tell we love him already and are very pleased with his temperament and cute polar bear looks. Here are some pictures of Argus from the first week we brought him home. He has grown a lot and I will post the most recent pictures soon. He weighs 12 pounds as of last Friday. He is the most wonderful puppy and has a very happy outgoing temperament. He has gone on his first hike. Last Thursday on a beautiful autumn day we went for about a two mile walk in the woods. He did very well, even though we did carry him a few times. I take him for a walk everyday around our property. We also went on lots of car rides and he is doing very well. He does not cry or have a problem with car sickness. Yesterday we were up in the woods all day getting firewood. He and Gracie had a good time exploring and finding just about every kind of poop there is out there. So Argus has definitely made himself a place in our home and in our hearts. We love him! I just wanted to send a note to thank you so much for breeding such great dogs! I purchased Saubay out of your Boss / Saratoga litter. She is one very special canine. Everyone that meets her is in awe of not only her beauty and structure, but even more so of her super sweet and willing disposition. I cannot say enough about her. She is very gentle, smart, intelligent, super athletic, and just wants to please and love everyone. She loves to crawl into our laps and pretend she is a tiny lap dog. She is very gentle with small children and older seniors. 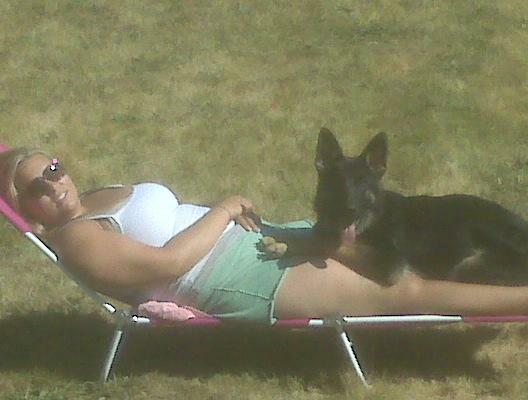 She also loves to mother my 3 year old male GSD. She is constantly bathing him with her tongue and watching over him. She is fun to play with as she is so agile. Once we finish 3 levels of obedience training, we will begin agility as she will excel in it. We are about to finish Level I obedience and she will graduate within the top 2 spots of the class. Next month we plan to have her certified as a therapy dog. She will do very well with this as we feel she will make many people happy that are seriously ill both mentally and physically. She will accompany my 3 year old male as he does the rounds at the hospital and the mental institution. He brings a lot of joy to people that are depressed about their situations and I am certain that she will bring happiness to those patients as well. Again, I just wanted to thank you so much for your meticulous breeding program as Saubay has exceeded our hopes in our search for the perfect 2nd dog. We have a lot of plans to share the love and good nature she gives with those less fortunate. Well, what can I say? Not nearly enough!! Harley has been the most wonderful addition to our little family! His big brother Jackson and he are the best of buds, they have really bonded into something special! Harley is very smart, and learns things quite quickly. He loves to play fetch and of course, “keep away” from us when he’s feeling a little mischievous. He is such a happy dog, and he really keeps our older shepherd exercised (as well as us) as they romp and play whether it be in the backyard, up in the mountains, or anywhere. My folks just love it when we bring the “kids” up to their home to visit. Harley definitely has his “Gramma” wrapped around his paw! Harley is such a gentle, loving, and energetic spirited dog, he keeps us all going and extremely happy, we are so thankful for that! Also, we’d like to thank you for letting us come out and see him when he was a puppy, and for giving us little updates on how he was doing when he was just a lil’ guy. (10lbs when we picked him up to take him home seems little compared to the size he is now! Ha!) He looked just like a little bear cub when I came and picked him up to take him to his new home J I have had so many comments on what a beautiful dog Harley is, and I’m so proud, and I let each and every person who asks know exactly where I got him from and how to get to your website! You are so informative, patient, and knowledgeable about your dogs, and it’s so neat to be able to meet someone who is so passionate about the breed! I think its wonderful that you guys treat each and every lil’ guy and gal pup just like family, an that we have the ability to contact you and share with you how Harley is growing, and doing, I’ve never been able to correspond with a breeder after buying a pup before, most just sell the dog and that’s all, you never hear a word from them again. Who you are and what you do is extremely appreciated far more than you know! We’ll be sending you more pictures of “Harley’s Adventures” soon! We spent along time searching for the right place to adopt our new family member from. I had never really owned a purebred dog before and my husband was used to having boxers. After working for a vet for more then 10 years my husband had to really talk me into getting a GSD. I am thankful I did it now. I do not know what my life would be like without Cheyenne. From the start she was smart, outgoing, and confident. She keeps up with us on horseback. From day one we did not have trouble potty or crate training her. I take her everywhere with me. It has come to the point if she's not allowed to go, I won't go. The last year as been exciting and fun. She has gone though a basic and advanced off leash obediance class and this comming year brings more fun with tracking and agility classes signed up. We are now thinking of getting her a little brother and look forward to coming out to visit and meet more parents. Thank you for giving us a happy and healthy puppy that has turned into a wonderful dog. first had trouble finding the family, he was supposed to meet. I figured a returned puppy would be someone else's mess. Then you gave me the magical call and out the door we did go! and now thanks to Patchwork Shepherds we have found our SOUL MATE! He has done nothing but given us thrill after thrill. Anyone with hesitations on an older puppy, should PUT THEIR TRUST IN YOU!!!! We can't wait to get our next puppy from Patchwork, your dogs are worth their weight in gold! 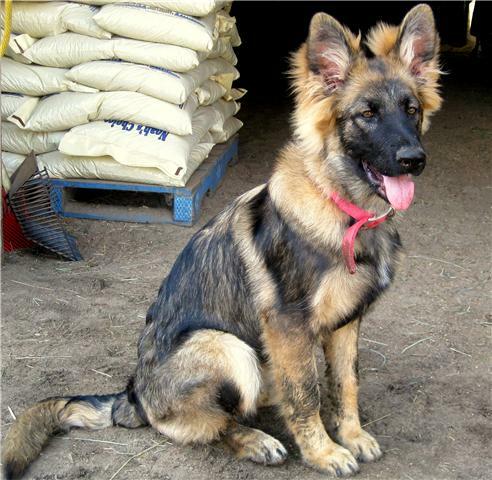 You provide beautiful, intelligent German Shepherd Dogs, Regal, Healthy and Bold! Rama is doing great! He is just shy of 21 weeks and weighs a whopping 44 lbs! He is adapting quickly to his new home on Orcas Island, WA and after 3 days already knows his new name. 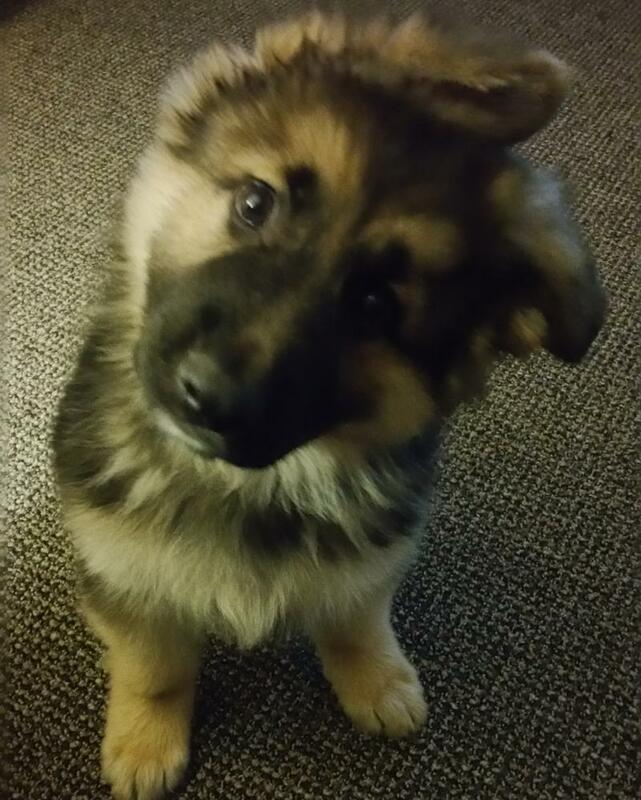 He is just the nicest German Shepherd Puppy I have ever met. He wants to meet and be friends with everyone. Everyone LOVES him. Thanks soooo much for this amazing blessing! Please feel free to have anyone call us for a reference. I just wanted to give you a quick update on pink - whom we have named Princess Anastasia Titiana Patchwork. ( Sadie x Doc Female ) She is doing great and our other dogs love her as much as we do. She is playing and sleeping - doing everything a puppy should. I have been telling everyone that I introduce Ana to - where she came from and what a great start in life she had. I sent a few pictures....Thank you for bringing Ana into the world so she can change ours. What can we say about Samson (Doc & Anna puppy)? He is perfect and wonderful. Thanks to all of your hard work with him before we picked him up at 8 weeks old he already knew his name and was mostly potty trained. We have had him 4 weeks now and he knows come, sit, shake, gentle, no and is working on wait, stay and load up. He walks on the leash with no problems and recently has been walking very short distances off leash as well. Samson is an extremely smart puppy and has learned things very quickly. He especially likes to tease Karla’s mom by going up and putting his mouth on her blanket and tugging just enough to get her attention. When she looks down and tells him no he grins at her and dances away to his own toys, then lays down and chews on them the whole time grinning like “I got Grandma”. He has become fast friend with his “Aunt Holly”, Karla’s mother’s dachshund, and enjoys playing with her and rolling her out of the way when she is being obnoxious. He never tries to hurt her and the other night we swear he was giving her a hug. mow the yard. Especially the clean the lawnmower time with the water hose at the end of mowing. He loves water but still isn’t too happy about bath time. Guess it is a boy thing and has to be his idea. We love our little boy and are looking forward to getting him a little sister in the next year or two. We would recommend you to anyone who was looking for a shepherd for a dog. Your patience with us as we came out many times to look at and hold our new baby was wonderful and your facilities are safe, secure and a great place for a puppy to grow or an adult to live and thrive. Thank you so much for our precious little boy. We are so thrilled with our two puppies, Sebastian (blue) and Kasia (red), from the Ivy/Cayden litter. We were so impressed with the puppies and their parents. You make sure that you provide the safest environment for your animals. John and I were so pleased to see the safety measures that you take prior to letting anyone be near or handle any of the puppies. Because of your loving care for your dogs we now have two of the greatest puppies that anyone could ever ask for in life! I am grateful for the time that we were able to spend with the puppies getting to know each and every one of them. However, it also made me want them all! We check your website frequently to see the pictures of all the beautiful puppies. You are wonderful about keeping everyone informed through your website just as you did while we were waiting to be able to take the Sebastian and Kasia home. We were also very impressed that you were so willing to let us come visit and you even encouraged us to do so. We thoroughly appreciate that you allowed us to be a part of the puppies lives even before they were in their new home. Through your attentive behavior to each and every one of your puppies we new the silly things they did, what they liked to play with all the way down to their little itchy spot that they liked to have scratched. You two are the best by far! We will definitely get another puppy in the future. We could never imagine getting a puppy from anyone else. The two of you have wonderful, healthy puppies and dogs that are part of your family! Because of all your love and attention we have two beautiful, healthy puppies that we will get to love for years to come. Thank you so much for our beautiful puppies! We will send more pictures of Sebastian and Kasia playing in their new home. I have attached a picture of Sailor at the beach. She has just finished digging a big hole and is very satisfied with herself. I want you to know that she grew up to be a very special dog. She is 11 months old now and is as smart as anything. She is also kind and the kennel where she goes says that she is the best daycare dog they have ever had. She is either the little sister or big sister, depending on what her friends need her to be. We are having her trained by the same kennel owner, one on one, and he tells us that she is an amazing dog. She is brave and confident and learns new things very easily. So just wanted you to know that all is well and we are very happy with her. I hope your business is going well and that you are happy and well in your new home in Idaho. We just wanted you both to know how wonderful it is having Lucia in our lives. Not only is she beautiful, but she has a great spirit as well! She is a super happy puppy and so incredibly intelligent. We were at our first night of Agility tonight at the dog club and at the end of class, a man said to me "That is one very bright pup." He and his wife were very taken by her. She learns very fast and I don't think there is anything she couldn't be taught. She really enjoys the daily walks in the woods, investigating all there is to see and sniff out what wildlife might have passed through the night before. We cannot wait to take her to the lake for her first time swimming. I'm sure she'll love it! She is fearless and an adventurer at heart. Thank you both so much, we love Lucia! 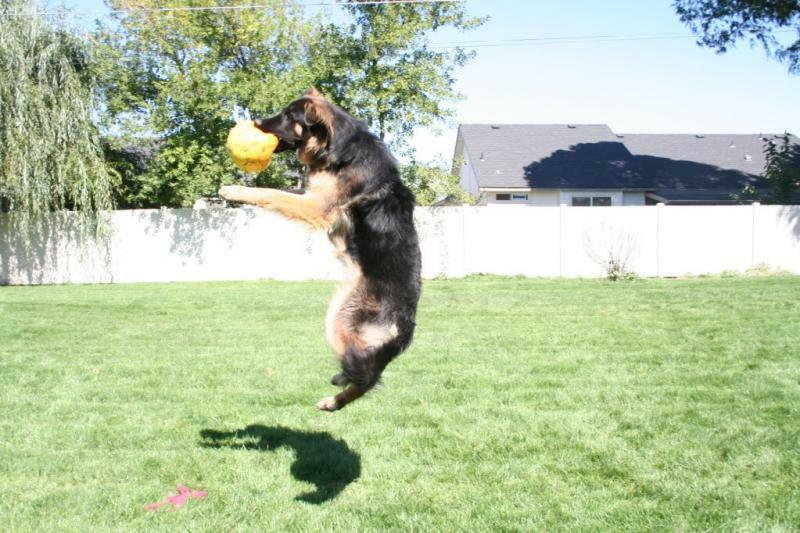 We will keep you posted on her Agility as well as her upcoming Obedience classes. She is very special to us! Anna, Ric, Vito and now....Lucia too! Here is one of the pictures that Matt took as we picked Samson up on Sunday and another one that Steve took that same day when we got him home. We'll keep in touch and let you know how he continues to grow! Boss x Sidney Male puppy named Samson lives in Boise Idaho! We love her, she is so sweet and she is doing so good! She drinks lots of water and eats her food. she goes potty when we take her outside to go. She is learning to run after the ball with Angel(STD Poodle) She did not cry during the night. She even walks on a leash. She is truly "MAGIC'! She loves to put her paws in the water bowl. Rick took her this morning down to the front yard on the lake and she went to the boat launch and picked up a stick, soon she will be a water dog jumping off the dock. She will take her first trip to Eastern Washington this weekend with us, she will like the 60 acres of forest we have. I am sure there is snow so I don't know how much we can be outdoors. We are a stones throw away from Lake Roosevelt so she will have water over there also in the summer to play in . She is a lucky dog! and we are lucky owners! I want to thanks you for breeding such wonderful pups and the pictures you took of the litter and Magic our priceless. CHECK BACK FOR MORE TESTIMONIALS !! !